At New Year’s time Rampart was a very popular place. Canada and American side, they all came to celebrate, because Dan Cadzow had a store there. So they came in with furs, and everybody started shooting up in the air, to celebrate…And at the same time they rang the church bell, and all the dogs just ran away. 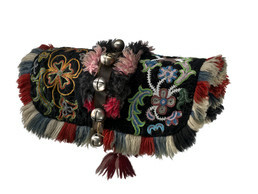 For special occasions, Gwich’in chiefs and wealthy men dressed their sled dog teams in beaded velvet blankets with sleigh bells and long yarn fringes. Blankets were usually made in sets of four or six to outfit the whole team. The right half of this blanket is decorated with small seed beads and the left half with appliquéd cotton braid. In addition, the dogs wore tall “antlers” on their harnesses, decorated with ribbons, bells, and fox tails. Eliza Jones: It’s a dog blanket, łeek ts’ede [dog blanket]. What do you call it? Trimble Gilbert: Łąįį ts’at, “dog blanket,” and I heard about it. And “bell” is lagal’yuu they call it. Eliza Jones: This we call denletl’eeze [bell]. I’ll lift it up. So looks like canvas backing, and then it’s got patches of moose hide sewed to it that have strings attached to it. One side is done [embroidered] with string, and one with beads, really pretty beadwork. It doesn’t have too many flowers on there, but I love the leaves. Old-time beads, some metal beads, small seed beads. Trimble Gilbert: They put it on top of the dogs like [over the back]. And then this [two strings attached to underside at corner], you got four, and you have to tie it onto the harness at the four corners. Kate Duncan: And the bells go across? Trimble Gilbert: This way [along spine] I think. Trimble Gilbert: When they were coming [to a village], they could hear [those bells from a] long way [off]. That’s what people said. Judy Woods: A long way. Because dogs [in the village] would bark when they heard the bells [in the distance] before that guy [driving the dog team] came. Kate Duncan: It must have been very exciting. Trimble Gilbert: Yes, exciting, someone was coming. When [sled] dogs heard those bells, they worked hard together too. Aron Crowell: When would a blanket like this be put on dogs? Kate Duncan: Yes, early twentieth century, very early. Judy Woods: Who was that? Kate Duncan: Dan Cadzow at Rampart Hills? Trimble Gilbert: New Rampart, yes. There’s a lot of stories of dogs from that time. At New Year’s time Rampart is a very popular place, Canada and American side. They all come to celebrate, because Dan Cadzow had a store there. That old lady said during New Year’s, everybody started shooting up in the air to celebrate and at same time, they ring the [church] bell. All the dogs just ran away. Then after a few days they came back, they’re hungry. So that’s the time they use this dog blanket, that’s what I heard. Eliza Jones: So, for special occasions then, they use these. Trimble Gilbert: Right, although maybe chiefs and some wealthy people are the ones that have a good fancy harness with this kind of dog blanket. So I heard that when this thing [dog blanket] is on, when they’re coming, they could hear that [bells] from a long ways. Eliza Jones: And these bells, they must have come attached to this leather. Eliza Jones: You don’t mean the blanket, just this [bells]? Judy Woods: Mm-hmm, the bells. First it was his brother, you know. His mother had a son, and he was crippled, he couldn’t walk. And that guy used to make snowshoes, sleds. He had just four [bells] I think, and he had them right on the front of his sleigh. He had good dogs too. He’d tell us kids to stay way back, and he’d lay the harness down, then he’d untie those dogs, because he crawled around. Then he’d holler, and those dogs just listened to him. He unhooked them and then called them, and he just hooked them up. They waited for him too until he got on the back of the sled. Eliza Jones: The dogs knew, wow. What was his name? Judy Woods: Horace Albert we used to call him, from Cos Jacket. Trimble Gilbert: They’re trained dogs. Judy Woods: And fast dogs. Kate Duncan: And then the standing irons? (3) Can you tell us about them? Did they decorate them? łąįį jì‘ — that’s “dog antlers” they call that. Kate Duncan: They had those pom-poms. And ribbons? Trimble Gilbert: Yes, ribbons too. Kate Duncan: And sometimes feather dusters some places. Trimble Gilbert: Materials were more available there [New Rampart], because Dan [Cadzow] was there. He’s a trader, so that’s where they got their materials—food and everything, knives, guns. 2. The image referred to is included in the illustrations associated with this object. 3. Standing irons are depicted in one of the illustrations associated with this object. For special occasions, Gwich’in chiefs and wealthy men dressed their sled dog teams in beaded velvet blankets with sleigh bells and long yarn fringes. (1) Blankets were usually made in sets of four or six, to outfit the whole team. One side of this blanket is decorated with small seed beads, and the other with appliquéd cotton braid. In addition, the dogs wore tall łąįį jì‘ [dog’s antlers] on their harnesses. The łąįį jì‘ were hung with ribbons, bells, and fox tails. Dog blankets developed as an art form in the 19th century, after trade beads became available in abundance. They were made not only by the eastern Gwich’in but also by Canadian Athabascan groups all the way to Hudson’s Bay.